My grandmother, whom I call Memere, has style. In her youth she worked for the government in D.C. during World War II, and dated servicemen and undersecretaries. In her prime she wore furs and diamonds, and traveled the world. When I was a little girl, she brought me trolls from Norway and teddy bears from Ireland. She made pickled shrimp and pork rillettes at Christmas. And in her old age she has a story for every occasion. Memere recently celebrated her 90th birthday, and we took the Nuni down to visit her. And because everyone deserves a homemade cake on their birthday, and 90th birthdays deserve extra special consideration, I took a homemade cake. Memere loves moist, spicy cakes, and carrot cake is one of her favorites. 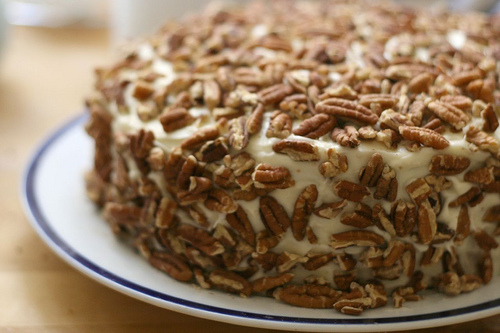 I used a recipe for a carrot cake studded with pecans, one of her favorites, and frosted it with the classic cream cheese frosting. To add a little bit of pizzazz, I flavored the frosting with a little orange oil , which adds a fruity orange flavor without changing the texture (flavored oils are usually much more intense than extracts, which means you can use less of them). Carrot cake is (or should be) moist because it has the extra water from the shredded carrots, and this cake is particularly moist because it bakes into three thin layers, which means the ratio of moist creamy frosting to cake is particularly high. It also means the layers are pretty delicate, and the cake is much easier to assemble if you freeze the layers ahead of time. I also couldn’t find two matching 9 inch pans, and I didn’t want to bake the three layers separately, so the frozen layers helped me trim the sides to be even. I had to take this cake on a two hour car drive complete with two other adults and a toddler (in a not very large car). To prepare it for transport, I added chopped toasted pecans to the outside, which can hide a lot of woes. With the nuts, I didn’t have to worry about the finish on the frosting smudging or rubbing off. Then I put my largest mixing bowl over the cake, resting on the plate upside down — the bowl wasn’t touching the cake at all (and if it does, it touches the nuts) and put the plate and bowl in a basket that was only slightly larger than the diameter of the plate so the plate wouldn’t have a lot of room to jostle. A box only slightly larger than your cake plate will also work. This is my Memere. Isn’t she lovely? I always tell her she doesn’t look a day over seventy. The cake was good too. That fork is wielded by the Nuni, who couldn’t wait to get her paws into cake, true to form. She proceeded to eat half the piece, I barely got any at all. Memere fell a few days ago, and ended up in the hospital with a few fractured ribs. She’s doing OK, and out of the hospital in a rehab center, but she tells me to feel sorry for anyone with a fractured rib because it is no fun at all. If the wide world of the internet could spare a few good thoughts for my grandmother, I’d appreciate it. And if you’re wondering whether now is a good time to bake a special cake for someone you love, go ahead and do it. People you love deserve cake. Prepare 3 9 inch cake pans with Baker’s Joy or butter and flour. Cream the butter with your standing mixer, or an electric mixer, until it’s white and fluffy. Add the sugar and continue beating until the mixture is very pale and nearly doubles in volume. It’s nearly impossible to overbeat at this stage. In a medium bowl or on a piece of parchment, combine the flour, baking soda, cinnamon, and salt, and mix well. Add the dry ingredients, alternating with the eggs, beating after each addition. Add the vanilla and the carrots and beat on medium speed until thoroughly mixed. Fold in the nuts. Divide between the 3 cake pans and bake until skewer poked into the middle comes out clean, 25 to 30 minutes. Remove from the oven and let rest in the cake pans for 10 minutes. Turn onto wire racks, remove from the pans, and let cool. Wrap each layer in plastic wrap and foil, and freeze overnight. Combine the ingredients for the frosting and beat until spreadable consistency. To assemble the cake, anchor the bottom layer with a little frosting. Spread ½ c- ⅔ c. frosting onto the bottom layer, spread to cover, then add the second layer and repeat. Use the remainder of the frosting to cover the top and sides. Toast ¾ c. chopped pecans. Press them into frosting. Add birthday candles and serve. I loooove carrot cake. Tucking this recipe away for a special occasion. Happy belated birthday to your Memere! new to your post discover lovely pictures and yummy receipes, thanks for allowing me to feast my eyes. Your grandmother is truly a beauty. I would give anything to look like her in my later years! I’ll be 70 very soon. Hope my granddaughter bakes a lovely cake for me!